Conversion of the Navasota (AO-106) and Waccamaw (AO-109), the first two ships authorized, were expensed under the fiscal year 1963 budget. Launched in 1946 at the Chester yard of the Sun Shipbuilding and Dry Dock Company, they were the youngest of the numerous T3s built for the navy in the Second World War. After "jumboization," a term used to describe the splicing of a new and larger center section in a tanker to increase its capacity, the ships would emerge with an overall length of 644 feet and a full load displacement of 35,000 tons. midbody was then floated in, properly positioned, and welded to the old bow. Next, the 190-ton superstructure amidships was lifted from the old midbody to the new section. The original section was then cut from the old midbody and floated away. In the final step of the transformation, the new midbody with old bow and superstructure now attached was floated into the dry dock, raised, and welded to the old stern. Modifications, including a new counterbalanced rudder, new struts, and shorter propeller shafts, were made to the stern to compensate for the longer underwater body. The latest in fueling and replenishment-at-sea equipment was installed to complete the conversion. These included kingposts with outriggers, ram-tensioned span wires and highlines, heavy-weather rigs with up to three hundred feet for either hose or wire at each station, electric-hydraulic winches in place of the old steam winches, and a helicopter platform on the forward weather deck. Each fueling station was equipped with new 7-inch lightweight hose, and the pumping capacity was improved by installing larger cargo pumps and piping. Conversion of the sister ships Mispillion (AO-105), Passumpsic (AO-107), and Pawcatuck (AO-108) followed in FY 1964. All five would later be transferred to the Military Sealift Command where they would serve until well into the late 1980s--a remarkable testament to the excellence of their original design and the skill of the builders. During the 1960s, many of the Essex-class aircraft carriers of World War II vintage were modified into antisubmarine warfare (ASW) support carriers (CVSs). 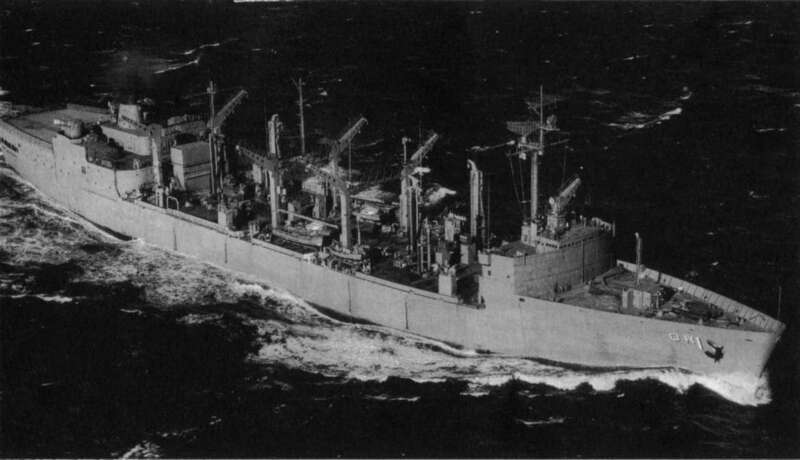 To support this class of ships, a new type of replenishment oiler was developed around the needs of the CVS task force.2 Classified as AORs, they were designed to provide rapid replenishment at sea of petroleum and munitions and had a limited capacity for provisions and freight. Though similar to the AOE in concept, economy measures limited the capabilities of these ships, especially with regard to speed. Roughly two-thirds the size of the AOE, they had a much smaller ammunition capacity and were limited to only 20 knots. The latter was a major cost-saving measure, since the ship's machinery requirements were reduced from the extraordinary 100,000 s.h.p. installations of the Sacramento class to a moderately powerful, 32,000 s.h.p. installation more typical of those in use on commercial vessels. Steel in San Diego. All the rest were constructed by General Dynamics in Quincy, Massachusetts. replenishment types, many of which were reaching the end of their useful lives. The task of scheduling, coordinating, and controlling these operations fell under the command of the Logistic Support Group (TG-73.5). This was a temporary command held alternately for a period of two to three months by the commanders of Service Squadrons 5 and 7 who rotated with the assistant chief of staff for readiness of Service Group Three. This policy allowed the squadron commanders to gain practical knowledge of the extensive UNREP activities conducted off the coast of Vietnam and provided operational command experience. The insights gained from this experience provided a perspective that gave these commanders valuable lessons that could be used to better train and prepare the ships in their commands for deployment upon their return. As operations intensified, it became apparent that the constant change in command was a major disadvantage that brought with it a lack of continuity and created problems within the service squadrons during the extended absences of their commanders. To remedy this situation, Service Squadron 9 was established in January 1969 with a commander assigned for a one-year tour of duty. 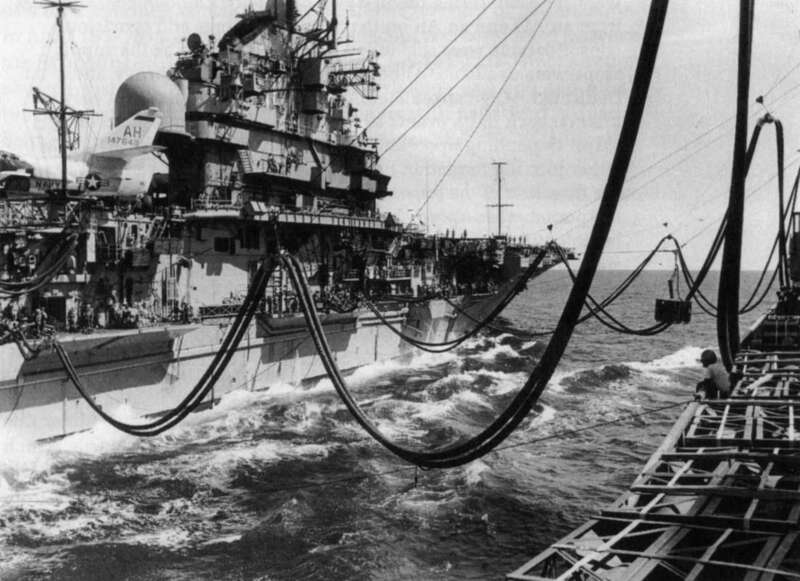 In the early stages of the conflict, fleet oilers, usually two in number, would be engaged in a five-day replenishment routine that commenced at either of the two major operation areas off the coast of South Vietnam code-named Dixie and Yankee Stations. Departing from Subic Bay in the Philippines, the first oiler would steam to a rendezvous with the carrier task group or groups operating within Dixie Station. Refueling the task group on the first day, she would then swing clockwise through the Market Time area (see map 2) replenishing along the way on day two. 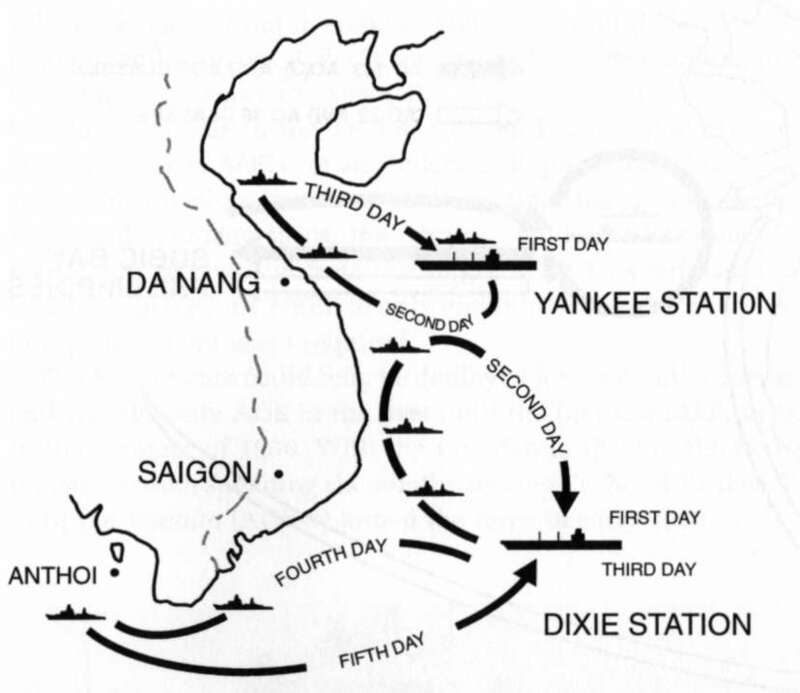 Returning to Dixie Station on the third day, she would steam south along the coast to An Thoi on the fourth day, and return to Dixie Station on the fifth day. A second oiler from Subic Bay would rendezvous at Yankee Station where she would replenish the carrier task groups on the first day. Then she would swing clockwise through the northern Market Time stations and into the Gulf of Tonkin on the second day, return to Yankee Station on the third day to replenish the units there once more, and perhaps consolidate with an incoming oiler before returning to Subic Bay. miles north into the Gulf of Tonkin to refuel the ships on air rescue stations or in the positive identification radar zone whose tasks included air surveillance and control. 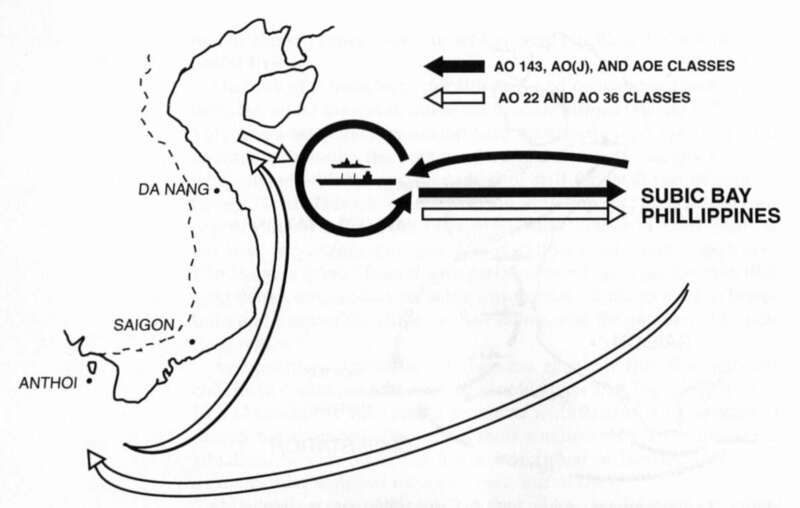 After leaving Yankee Station, the ship would proceed along a thousand miles of coastline replenishing naval gunfire support, amphibious, and Market Time ships, and then return 1,300 miles back to Subic Bay for resupply (see map 3). As in Korea, the navy soon found the low pumping rates and jet fuel capacity of its oilers to be inadequate--this meant long times alongside the carriers. In June 1967, commander Service Group Three implemented a revised oiler rotation plan to improve the utilization of the greater pumping capabilities of the AO-143 class and the jumboized AO-105 class. These larger oilers remained in the vicinity of Yankee Station for their entire replenishment cycle. As shown in the accompanying table, they were equipped to deliver aviation fuel at much greater rates than their Korean War predecessors. 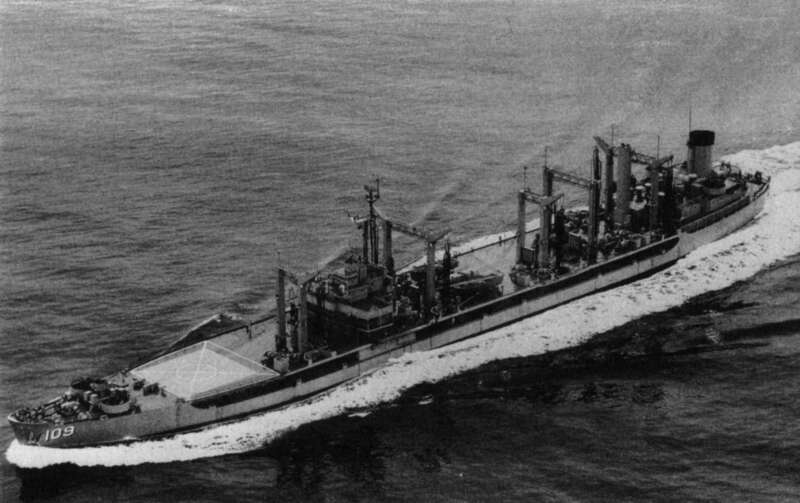 Under the new plan, the smaller AO-22 class oilers (the Cimarrons of World War II vintage) left Subic Bay and transited to the southernmost Market Time area, and from there proceeded north replenishing ships along the coast and up in the Tonkin Gulf. Then they went to Yankee Station to transfer remaining fuel to the larger oilers or an AOE, returning to Subic Bay for resupply. of the operations conducted by the new ships. During this period the Ponchatoula conducted 484 underway replenishments to 503 ships, transferring fifty million gallons of fuel and 69 tons of freight. She conducted twenty underway replenishments and one consolidation with another oiler in a single day in November, transferring 2,680,000 gallons of fuel oil and 653,000 gallons of jet fuel during a 24-hour period (see table 24). SOURCE: Miller, "Mobile Logistic Support for Aircraft Carriers," 54. When the planes from the aircraft carriers Ranger (CV-61), Coral Sea (CV-43), and Hancock (CV-19) commenced routine bombing of North Vietnam on 7 February 1965, the Sacramento, the navy's newest UNREP ship, was in the Tonkin Gulf on her first deployment. The advantages of an AOE over an Underway Replenishment Group (URG) were immediately appreciated by the carriers. Instead of making three stops with as many ships, the carriers could simultaneously refuel, rearm, and reprovision from the single AOE. This reduced the time spent alongside for UNREP to only one-third and reduced the number of replenishment ships required. The Sacramento could only be deployed for six months during 1965 and was the only AOE in the fleet until the Camden (AOE-2) arrived in the summer of 1966. With the Camden in theater, the two AOEs traded off, each spending six months serving TF-77 on Yankee Station until the Wichita (AOR-1) joined the force in early 1969. The Camden departed Long Beach 28 May 1968 enroute to her second deployment in Western Pacific. Her first stop was the Naval Supply Depot Seattle, Washington where provisions and stores were loaded. The ship moved to the fuel pier at Manchester for POL (petroleum, oil, lubricants) loadout and then to Naval Ammunition Depot Bangor to complete ordnance loadout. Missiles and special weapons had been previously loaded aboard by Naval Weapons Station Seal Beach. The ship departed Bangor on 10 June for Subic Bay arriving on 26 June. The Camden was scheduled for a total of six line periods under this concept. All were completed successfully except for the fourth, which was terminated on 26 November following a collision with the Hancock, which resulted in the unexpected transfer of two planes from the Hancock to the Camden's deck. This forced Camden to proceed to Subic Bay in order to offload the unwanted aircraft before steaming to Yokosuka, Japan, to effect repairs. The Camden returned to Subic Bay to complete her last two line periods before departing for Long Beach on 22 February 1969. SOURCE: Miller, "Mobile Logistic Support for Aircraft Carriers," 56. When the Sacramento and the Camden deployed to Southeast Asia, they were equipped with the same type of ship-to-ship cargo rigs as had been employed in the Korean War (see table 25). Although most of the ordnance transferred at sea was palletized, none of the carriers was outfitted to strikedown the munitions transferred via this means directly into their magazines. Nevertheless, palletization proved to be a much more efficient means of handling munitions doubling the amount of ammunition that could be handled during UNREP and allowing the hangar deck to be cleared much more quickly.